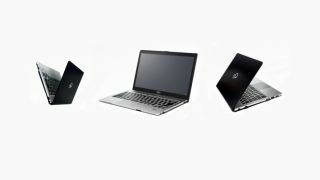 Fujitsu is launching a slew of touch-centric notebooks and 2-in-1 convertibles with one eye on the business market. The company claims to have targeted employees' specific needs with the devices, whether that's all-day battery life, lightweight portability or rugged durability. Fujitsu's 13.3-inch Lifebook S904 laptop packs a quad-HD display (2560 x 1440) with an optional matte finish. Its module bay drive means that you can bulk up with an optical disk drive, second hard disk or battery to provide up to 24-hour battery life. It's being outed alongside the Lifebook U904, which Fujitsu describes as the thinnest 14-inch business notebook doing the rounds. Measuring 15.5mm at its thickest point and weighing 1.39kg, it gets a Sharp 3200 x 1800 pixel-resolution IGZO display (touchscreen is optional) and a backlit keyboard. The new models are being launched alongside a duo of 2-in-1 convertibles, which starts with the Lifebook T904, a 13.3-inch ultrabook that also gets an IGZO display and measures 17.1mm thick. Launching alongside it, the Fujitsu Lifebook T734 gets a rotatable display that bulks up on security by offering a SmartCard reader. The Lifebook U904 will be available from the middle of October, while the S904 will arrive later during mid November. The T904's scheduled for availability in January 2014, as is the T734. No word on pricing yet.